Until last week, I thought I knew what a croissant was. Anyone who has lived in France knows that late spring is full of jours fériés, that is, bank holidays. For many, a five-day workweek is rare at this time of year. This means we’ve been frequenting our local bakeries, and enjoying lazy mornings, more than usual. 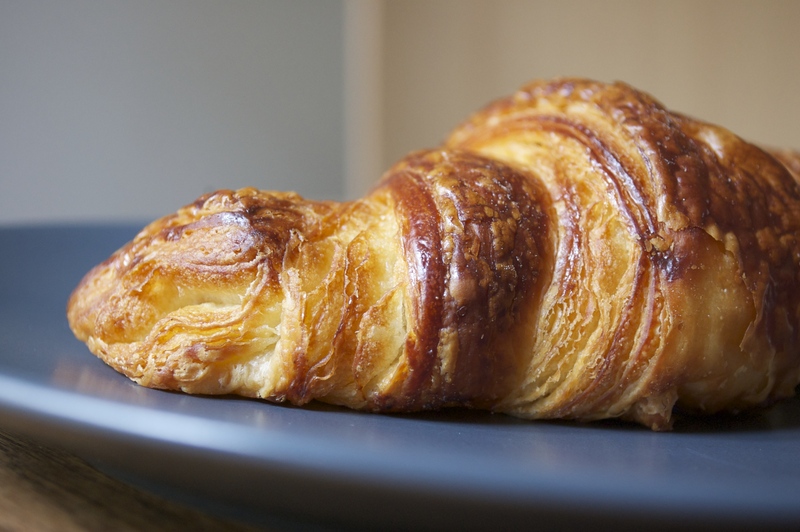 French breakfast pastries are one of the more tempting foods I can think of and I like alternating between a chocolate croissant, pain au raisin, brioche, or simple plain croissant. With all my trips to the bakery you’ d think I’d know what a croissant was, or more precisely, the difference between a croissant au beurre and a croissant ordinaire. My story starts on a Thursday evening, yes, on a recent long weekend in May. We’d spent the day hiking in a small town called Maincourt-sur-Yvette, which lies just outside of Paris. Upon arrival back in the city, Sébastien, Little Buddha and I we were sunned and tired. The idea of parking the car in the garage (a ten minute walk from our apartment), didn’t appeal of any of us, so instead we left it outside on the street under some shady trees. That was our mistake. By morning, The Rooster looked like the sore loser in a paintball fight. Our car was covered in purple, green, and black splotches of oversized pigeon poop. It was an impressive sight, as Paris pigeons have no mercy. Friday was thus dedicated to finding a self-service car wash on the outskirts of the city, getting there and scrubbing the car. While we were at it, we decided to take out Little Buddha’s car seat and clean that, too. Like with cooking, when we start a project, we go all out. Cut to the chase. Sunday morning, the car was back in the garage, but the baby seat was still sitting (nice and clean) on the kitchen floor. Sébastien had to leave by 8am for a tennis game, and I had to be at the airport by 10am to pick up my mom. Sébastien’s task was to go get the car, park it where he could, run up to get the seat and fasten it to the rear bench. My job was then to find a proper parking space and run to the farmers’ market before I had to leave for the airport. It seemed like we were the only family up so early on this particular Sunday morning. No one had ventured out to leave us a parking spot, so Little Buddha and I just got in The Rooster and drove away. I felt that giddy feeling you get when playing hooky. We were supposed to be grocery shopping; instead we found ourselves watching ducks and fishermen in the Bois de Boulogne. We got back to our neighborhood just in time to drag my jet-lagged mother to the market, but we missed the croissants at our usual bakery. That turned out to be my good fortune, and led to my learning about croissants. Our bakery only makes croissant au beurre, but I had already seen both butter and ordinary croissants in other bakeries before. I’d assumed one simply contained more butter than the other. Don’t all croissants have butter in them? At the alternate bakery we went to, I asked the boulangère what the difference was between the two croissants displayed in the case. Butter croissants are made with butter, while ordinary ones are made with margarine. You can guess which ones I took. This entry was posted in Everyday Life in Paris, What's a...? and tagged breads, brunch, markets. Bookmark the permalink.